Sonexis Conference Bridges provide Audio, Web And Video Conferencing on a Microsoft Server 10.00 Designed to work within existing voice and data networks and available with a fully integrated Web with HD Video conferencing option — ConferenceManager2 has been deployed by hundreds of leading organizations with minimal cost, effort, or administration. ConferenceManager2 can be installed in most environments in under an hour and scales easily from 12 to into the 1,000s of ports of audio and 5 to 1,000 seats of Web. With ConferenceManager's unique architecture you're never more than a license key away from adding features, users or protocols. Administration is made simple by intuitive tools, comprehensive reports and complete flexibility to meet your organization's needs. Need a quote on a premisd base or hosted solution? Call us at 800-335-0229. On-premise audio and web conferencing! Own your hardware and eliminate transport and bridging fees. Sonexis conference bridges allow businesses to satisfy their conferencing needs with significantly improved savings, ease and control. They plug right into your current networks so there is no need for upgrades or a new infrastructure. Sonexis unique design makes it so that a license key is all it takes to add new features. The teleconferencing system provides reports that help the user make decisions about how to run the company’s conferencing. What challenges do you face? We can help, call and ask us your questions. Our team is ready to help. 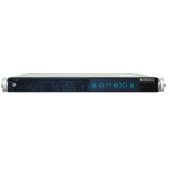 Sonexis Audio Conferencing System 24 Ports to 600 Ports with Web Conference and Outlook Integration.